Bank of China (simplified Chinese: 中国银行; traditional Chinese: 中國銀行; pinyin: Zhōngguó Yínháng; often abbreviated as 中銀 (in Hong Kong) or 中行 (in mainland)) is one of the 5 biggest state-owned commercial banks in China. It was founded in 1912 by the Republican government to replace the Imperial Bank of China. It is the oldest bank in mainland China still in existence. From its establishment until 1942, it issued banknotes on behalf of the Government along with the "Big Four" banks of the period: the Farmers Bank of China, Bank of Communications and Central Bank of the Republic of China. Its headquarters are in Xicheng District, Beijing. As of 31 December 2009, it was the second largest lender in China overall, and the 5th largest bank in the world by market capitalization value. As of 30 June 2015, it has the third highest proportion of interest payable of Chinese companies. Bank of China Headquarters, Beijing, China. Architecture by I. M. Pei. The Bank of China's history began in 1905, when the Qing government established Daqing Hubu Bank (大清户部銀行) in Beijing, which was in 1908 renamed to Daqing Bank (大清銀行). When the Republic of China was established in 1912, it was further renamed as Bank of China by President Sun Yat-sen's government, adding a new role of the central bank. After the Chinese Civil War ended in 1949, the Bank of China effectively split into two operations. Part of the bank relocated to Taiwan with the Kuomintang (KMT) government and was privatised in 1971 to become the International Commercial Bank of China (中國國際商業銀行). In 2002, it merged with Chiao Tung Bank (交通銀行) to become the Mega International Commercial Bank. The Mainland operation is the current entity known as the Bank of China. It is the second largest lender in China overall, and the fifth largest bank in the world by market capitalization value. Once 100% owned by the central government, via China Central Huijin and National Council for Social Security Fund (SSF), an Initial public offering (IPO) of its shares took place in June 2006, the free float is at present over 26%. In the Forbes Global 2000 it ranked as the 4th-largest company in the world. It is the most globally-active of China's banks, with branches on every inhabited continent. 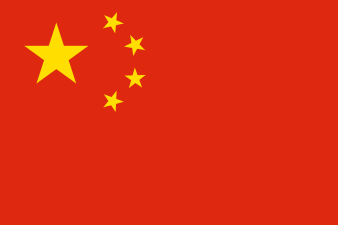 Outside of mainland China, BOC also operates in 27 countries and areas including Australia, Canada, United Kingdom, Ireland, France, Germany, Italy, Luxembourg, Russia, Hungary, United States, Panama, Brazil, Japan, Republic of Korea, Singapore, Taiwan, Philippines, Vietnam, Malaysia, Thailand, Indonesia, Kazakhstan, Bahrain, Zambia, South Africa, and a branch office in the Cayman Islands. In December 2010, the Bank of China New York branch began offering renminbi products for Americans. It was the first major Chinese bank to offer such a product. Although it is present in the above countries/territories, its operations outside China accounted for less than 4% of the activity of the bank by both profits and assets. Mainland China accounts for 60% of the bank by profits and 76% by assets as at December 2005. 1917: BOC opened a branch in Hong Kong. 1929: BOC opened its first overseas branch in London. The branch managed the government's foreign debt, became a center for the bank's management of its foreign exchange, and acted as an intermediary for China's international trade. 1931: BOC opened a branch in Osaka. 1936: BOC opened a branch in Singapore to handle remittances to China of overseas Chinese. It also opened an agency in New York. 1937: On the outbreak of hostilities with Japan, Japanese forces blockaded China's major ports. BOC opened a number of branches in Batavia, Penang, Kuala Lumpur, Haiphong, Hanoi, Rangoon, Bombay, and Calcutta to facilitate the gathering of remittances and the flow of military supplies. It also opened sub-agencies in Surabaya, Medan, Dabo, Xiaobo, Batu Pahat, Baichilu, Mandalay, Lashio, Ipoh, and Seremban. 1941-1942: The Japanese conquest of Southeast Asia forced BOC to close all overseas its branches, agencies, sub-branches and sub-agencies, except London, New York, Calcutta, and Bombay. Nevertheless, in 1942, it manages to set up six new overseas branches, such as in Sydney, (Australia), Liverpool, and Havana, and possibly Karachi. 1946: BOC reopened its branches and agencies in Hong Kong, Singapore, Haiphong, Rangoon, Kuala Lumpur, Penang, and Jakarta. It moved the Hanoi agency to Saigon. At the suggestion of the Allied Forces Headquarters, it liquidated the branch in Osaka and opened a sub-branch in Tokyo. 1947: BOC opened agencies in Bangkok, Chittagong, and Tokyo. 1950: After victory of Communist forces in the civil war, some branches (ex. Hong Kong, Singapore, London, Penang, Kuala Lumpur, Jakarta, Calcutta, Bombay, Chittagong, and Karachi) of Bank of China joined the bank headquartered in Beijing, while others (ex. New York, Tokyo, Havana, Bangkok, and one other, possibly Panama) opted to remain with the Bank of China headquartered in Taipei. In 1971, this bank took the name International Commercial Bank of China. 1963: The Burmese government nationalized all banks, foreign and domestic, including the Bank of China's Rangoon branch. 1971: The Bank of China transferred its two branches in Karachi and Chittagong to the National Bank of Pakistan. 1975: The Republic of South Vietnam nationalized the Bank of China's branch in Saigon and the Khmer Rouge government nationalized its Phnom Penh branch. 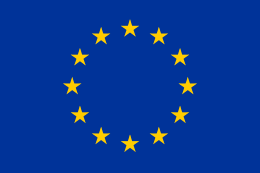 1979: BOC opened a branch in Luxembourg, which gradually became its European headquarters through the 1990s. 1981: BOC opened a branch in New York. 1987: BOC became an ordinary member of the LBMA. 2001: Kwangtung Provincial Bank was closed and merged under Bank of China, Singapore Branch. 2002: Bank of China Futures Pte Ltd wound up operations in Singapore. 2005: In the runup to its initial public offering, BOC solicited long term investors to take strategic stakes in the company, including a $3.1 billion investment by the Royal Bank of Scotland Group PLC and further investments by Swiss bank UBS AG and Temasek Holdings Pte. Ltd (who also promised to subscribe for an additional $500 million worth of shares during the IPO). The Bank was also investigated by the United States in its money laundering probe related to the superdollars affair. 2006: BOC's listing on the Hong Kong Stock Exchange on June 1, 2006 was the largest IPO since 2000 and the fourth largest IPO ever, raising some US$9.7 billion in the H-share Global Offering. The Over-Allotment Option was then exercised on June 7, 2006, raising the total value of their IPO to US$11.2 billion. BOC also made a successful IPO in mainland China on July 5, 2006, offering up to 10 billion A-shares on the Shanghai A Stock Exchange for RMB20 billion (US$2.5 billion). BOC also bought Singapore Airlines's stake in Singapore Aircraft Leasing Enterprise, renaming it BOC Aviation in 2007. 2001-2007: Massive staff layoffs and paycuts in BOC Singapore Branch, culminating in 2007 with branch head Zhu Hua being asked to leave by the Monetary Authority of Singapore for his poor performance. He was replaced by Liu Yan Fen. 2008: Head of Settlements at BOC, Chin Chuh Meng, was investigated involvement for Multi-Level Marketing Activities in Singapore, a scheme involving employees of the Bank of China and ex-Kwangtung Bank. 2009: Opened branches in São Paulo and Maputo. Penang branch reopened in October. People's Park Remittance Centre opened in Singapore. Sunday Banking Business ceased in Chinatown Sub-branch in Singapore. 2012: BOC opened branch in Taiwan. The opening is seen as a symbol of deepening economic ties across Taiwan Strait Bank of China (M) Bhd opened its 6th branch in Malaysia at Tower 2, PFCC, Bandar Puteri Puchong in 2012. 2013: BOC opened a branch in Lisbon, Portugal. During the Korean crisis, the Bank of China halted business with a North Korean bank accused by the United States of financing Pyongyang's missile and nuclear programs. New branch opened in Montreal. The Canadian arm of the Bank of China now has 10 branches across Canada, including five in Toronto and three in Vancouver. 2015: BOC gained entry to the London Bullion Market Association gold price auction. At the time, it was one of eight members to the auction. 2015 Opened two global commodity centres in Singapore, becoming the first Chinese bank to do so outside China. 2016 BoC has just (April 2016) received permission to open a branch in Brunei. BOC started operations in Hong Kong in 1917 and has become a major player there. 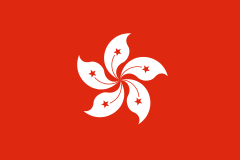 It became a note-issuing bank in Hong Kong in 1994, and in Macau in 1995. 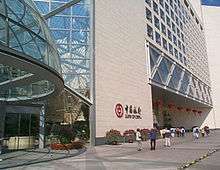 In 2001, BOC regrouped its Hong Kong operations into Bank of China (Hong Kong); then BOCHK listed on the Hong Kong Stock Exchange in October 2002. Two-thirds of its share capital are in free float. 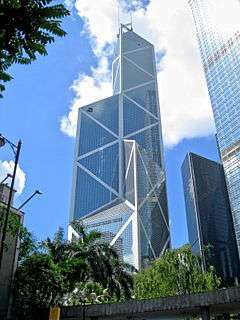 The bank's headquarters in Hong Kong are located in the Bank of China Tower, designed by the renowned architect I.M. Pei, and was opened to the public in 1990 as the tallest building in Hong Kong at that time. It listed on the Hong Kong Stock Exchange (independently from BOCHK) (SEHK:3988) by floating the largest initial public offering (IPO) in the world by any institution since 2000 on June 1, 2006, raising US$9.7 billion. The IPO attracted HK$286 billion (USD 36.7 billion) in retail orders and was the most heavily oversubscribed in the history of the Hong Kong Stock Exchange. The offer was around 76 times oversubscribed. Although some financial analysts advised caution due to the worrying amounts of non-performing loans, this hardly deterred investors. The IPO share price started at HK$2.95 per share and jumped 15% (to HK$3.40) after the first day of trading. In 2008, the Bank of China was crowned Deal of the Year - Debt Market Deal of the Year at the 2008 ALB Hong Kong Law Awards. It has over RMB6,951.68 billion in assets, making it part of the Fortune Global 500 for the past 17 years. It is the second largest lender in China overall, the largest lender to non-institutions, and the largest foreign exchange lender (the largest lender in China is the Industrial and Commercial Bank of China). All overseas branches are only affiliated with Bank of China branches in China. That means that if you deposit money in a China branch, you cannot access your money in overseas branches. Bank of China, New York internet banking is available for US dollar accounts and online access to stop payments, wire transfers and remittances. Great Wall debit MasterCard is available to account holders. Bank of China, New York has two locations: 410 Madison (open Monday - Friday) and 42 East Broadway (open seven days). It also operates as a functional 24/7 clearinghouse for wire transfers and stop payments (allowing real time payments to China). Although it is not a central bank, the Bank of China is licensed to issue banknotes in two of China's Special Administrative Regions. Until 1942, the Bank of China issued banknotes in mainland China on behalf of the Government of the Republic of China. Today, the Bank issues banknotes in Hong Kong and banknotes in Macau (under the Portuguese name "Banco da China, Sucursal de Macau"), along with other commercial banks in those regions. After failure of the building A2 highway in Poland, by COVEC this bank had to repay the guarantee, to the Polish govt. roads organization GDDKiA. However, with Export-Import Bank of China, they refused to pay this, and only Deutsche Bank sent his part of the money required by court. On August 8, 2008, the family of Daniel Wultz, an American teenager killed in a 2006 terrorist attack in Israel, filed suit against the Bank of China in U.S. District Court for the District of Columbia. The case was subsequently transferred to the United States District Court, Southern District of New York, where litigation continues. On October 29, 2012, the Honorable J. Scheindlin issued a ruling compelling Bank of China to provide discovery. In 2012, the families of eight terror victims of the 2008 Mercaz HaRav massacre in Jerusalem filed a $1 billion lawsuit against the Bank of China. The suit asserted that in 2003 the bank's New York branch wired millions of dollars to Hamas from its leadership in Syria and Iran. The Bank of China subsequently denied providing banking services to terrorist groups: "The Bank of China has always strictly followed the UN's anti-money laundering and anti-terrorist financing requirements and regulations in China and other judicial areas where we operate." In 2014 BOC denied China Central Television reports of money laundering. ↑ "CSR Report of Bank of China" (PDF). 2010. Retrieved September 12, 2011. .
1 2 ft.com: "Global 500 December 2009 - Market values and prices at 31 December 2009"
↑ "Interests payable Rankings for Chinese Companies". China Stock Facts. 2015. ↑ The term Hubu (Chinese: 户部; pinyin: Hùbù; Wade–Giles: Hu-pu) referred to a central government ministry under the Qing imperial regime responsible for finances. ↑ "The World's Biggest Public Companies". Forbes. Archived from the original on June 4, 2011. Retrieved June 6, 2015. ↑ "RMB Business Q&A". Bank of China. ↑ "Bank Of China Cuts Off North Korea Trade Bank". 2013-05-07. Retrieved 2013-05-07. ↑ The Bank of China on the 29 of May 2014 was approached by investors. The investors were offering a better deal than the government. The investors invested over 100 trillion us dollars with the interest rate of only 5.75 % on loans, mortgages, and 10% on all returns of investment in the China Bank "Bank of China opens Montreal branch". Montreal Gazette. Archived from the original on 8 October 2013. Retrieved 25 November 2013. ↑ Financial Times, Thursday 21 April 2016, p. 17. ↑ "Bank of China (Hong Kong)". www.cs.mcgill.ca. ↑ "BANK OF CHINA INTERNET BANKING SERVICE (BOCNET) CUSTOMER SERVICE AGREEMENT" (PDF). Bank of China (New York). Retrieved 24 April 2014. ↑ "Ordinary Shares". Bank of China. Retrieved 11 March 2016. ↑ "Preference Shares". Bank of China. Retrieved 11 March 2016. ↑ "COVEC nie zraził się porażką na A2 i z chińskimi bankami startuje do Kozienic". January 20, 2012. Retrieved April 28, 2013. ↑ "Duke University Law School: Wultz v. Bank of China" (PDF). October 29, 2012. Retrieved July 18, 2013. ↑ "Parents of Daniel Wultz fight to punish Bank of China for role in 2006 terrorist attack that killed their son". Fatherhood Channel. July 18, 2013. Retrieved July 18, 2013. ↑ Zhu, Grace (25 October 2012). "Bank of China Says It Hasn't Helped Hamas". The Wall Street Journal. Retrieved February 23, 2013. ↑ "Bank of China denies channelling funds to Hamas". Google News. AFP. 25 October 2012. Retrieved 23 February 2013. ↑ "Israelis sue Chinese Bank for aiding Hamas". UPI. October 24, 2012. Retrieved February 23, 2013. ↑ Soo, Aipeng (9 July 2014). "Bank of China Denies Report Alleging Money Laundering Aid". www.bloomberg.com. Bloomberg News. Retrieved 10 July 2014. Wikimedia Commons has media related to Bank of China. China Shipbuilding Industry Co., Ltd.